Issued September 30, 2003, to Nintendo Co. Ltd. 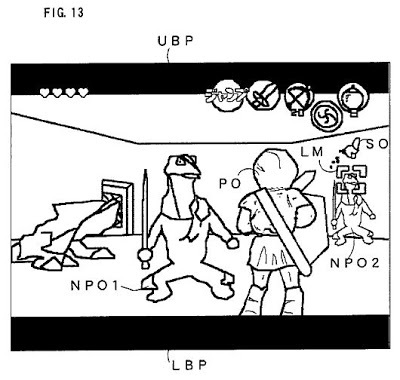 The ‘706 patent describes an image data generator which allows a player, while playing a three-dimensional game, to focus his character’s attention on non-player controlled objects with the push of a button. Whenever the button is pressed, the camera angle of the game changes to reflect the character’s new focused attention on the non-player object. A video game apparatus includes a reality coprocessor. The reality coprocessor performs a conversion process on image data to display a player object or non-player object according to image data transferred from an external ROM to a RAM, and supplies the image signal through the display. The reality coprocessor detects whether or not there exists a non-player object at around the player object on the display in response to an operation of a Z button. If a non-player object is detected, the reality coprocessor selects the non-player object as an attention non-player object. At this time, the hypothetical camera is changed in position and photographing direction such that photographing can be made for the player object directly facing the non-player object. 1. A video game apparatus coupled to a display, comprising: an image data generator for generating first image data to display a player object; an image processor for supplying an image signal to said display according to said image data in order to display, in a virtual three-dimensional space on said display, the player object photographed through a hypothetical camera from a third person perspective; a controller including a first operating member to instruct a moving direction of the player object and a second operating member that is operable to fix the photographing direction of the player object during game play to a current direction in which the player object is oriented regardless of changes in orientation of the player object after the photographing direction is fixed, wherein the fixed photographing direction is used during real-time game play display the player object from the third person perspective.